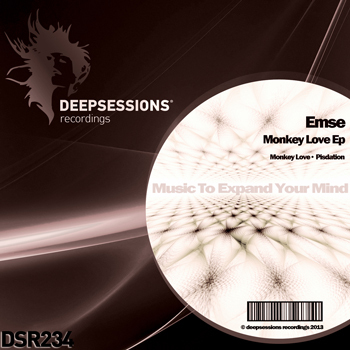 The “Monkey Love” original presents a lovely melodic vibe straight away. Growing atmospheres, tough beats and smooth chord changes carry the track to the main break where the melodies get further expanded upon and the result is that of real emotion. The track concludes with the well textured, fluttery synths conjuring up a floating vibe which carries the track to a classy conclusion. Lovely stuff from Emse. The companion piece “Pisdation” begins with a nice epic intro which builds some cool anticipation before the beats drops. Delicate stabs and complementary rhythms build to create some huge energy following the drop and take the track into trancy peak time territory. A huge production from Emse and it closes the EP out with a bang. Quality old school release from Deepsessions.